The planning conversation is when the teacher and principal/instructional coach/teaching peer collaborate and focus on the student-learning priorities established through the learner needs, core curriculum, and school improvement goals. 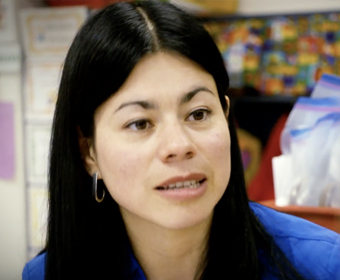 In this planning conversation, Martha Mancera, the teacher, and Karen Smith, the Kindergarten Coach, collaboratively focus on priorities of the lesson plan that the coach will be observing/supporting (see Martha’s Classroom) and the unique goals that Martha has for supporting the cognitive learning needs of her students. Martha highlights how the whole group instruction will be extended in learning centers, choice centers and independent work. Martha and Karen also discuss how Martha has developed individualized learning aligned to the Dual Language Kindergarten Curriculum Plan to support students (and their families) to be successful learners.